Oops - we don't appear to have a video for the MobileOffice D600. Plustek MobileOffice D600 Turns Your Pile of Paper Documents to Digitized Data in Minutes! Weighing approximately 450 grams, Plustek MobileOffice D600 is an A6 duplex true mobile color scanner. The D600 is specially designed to convert all your paper-based documents, plastic cards, embossed cards, ID cards and prescriptions into various digital formats such as JPG, BMP, TIF, Word, Excel, and searchable PDF files etc in minutes. Only by pressing a button, D600 captures both sides of documents and transfers them into a pre-defined directory location. D600 provides various setting options such as scan to file, e-mail, print, OCR, DI capture (a robust filing application) so that you can make the process of digitizing data without much of effort. Targeted at the Healthcare, Banking & Financial Services Industry (BFSI), Insurance, transport departments, utility, telecommunications, hospitality industry, service centers, D600 is the ideal solution in the mobile scanner range. The biggest strength of D600 is that it is phenomenally fast and does not drop speed even when scanning in duplex mode. It scans documents at 19ppm speed with 300 dpi in colour and 55ppm with 300dpi grayscale. 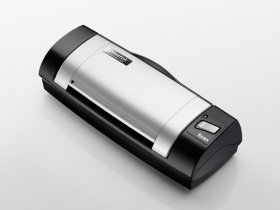 The scanner¡¦s speed increases when it comes to scanning images touching 70 ipm at 300 dpi grayscale. MobileOffice D600 is loaded with OCR (Optical Character Reader) software and patented ABBYY FineReader 6.0 Sprint Plus, which converts scanned documents into searchable PDF files. Therefore, users can save time searching information from a huge pool of digital database by inserting keywords or phrases. With DI capture, users can sort all documents and written materials such as checks, prescriptions, invoices, receipts and plastic cards in an organized catalog. For example, treasurers can find what they need immediately from the ordered folders of the DI capture. They can save time not flipping through all the bank statements, thus improving their productivity and meeting their boss - timely requirements. Moreover, in order to reduce the percentage of duplication errors occurring through traditional medicinal recording processes, MobileOffice D600 is capable of scanning both sides of insurance cards and HIPAA-related forms at patient registration and save them into the practice management or Electronic Medical Record (EMR) Application. Consequently, the staff can reduce registration time, solve data inaccuracy problems and improve customer relationships. Besides, MobileOffice D600 is designed to meet the legal requirements of Remote Deposit Services in the USA market. With Plustek check reader Software Developers Kit (SDK), D600 is capable of recognizing two kinds of MICR fonts i.e. E13B and CMC 7, and saves MICR data in a designated location. D600 is an ideal solution for small or mid-sized businesses that handle a moderate volume of checks.